Good: Captures quirky feel of the show, great autograph checklist, good design, generous swatches on costume cards. Bad: Not a lot of crossover appeal outside show's fans, small base card checklist. 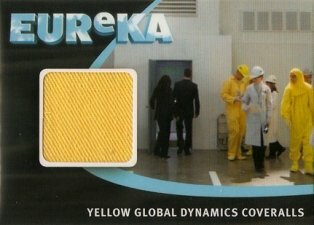 The Bottom Line: If you're not a fan of Eureka, you're probably not going to spend $40+ on a pack of the product. 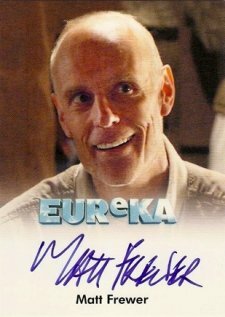 But for those who love the show, the set offers an excellent trading card take with a deep autograph checklist of main cast members, a limited production run and attractive designs. The base set features a simple but effective full-bleed horizontal design that includes a shot from the show and a simple caption bar and show logo. Coming from a strange show, the images are equally intriguing and make the cards standout. Card backs have another shot as well as a lengthy synopsis. Casting Call inserts have a nice vertical design highlighted by a rainbow foil finish. Both the front and back have character portraits. The lack of written profiles make these cards a little too simple. The autographs have a distinct Rittenhouse look. Set up vertically, they show a character portrait on the top two-thirds with plenty of white space left over for signatures. It's simple but extremely effective. My favorite cards in the set are the costume relics. Set up horizontally, they balance text, image and the swatch extremely well. The relic swatches are also larger than most sets. Rittenhouse continues to do an excellent job of snagging a huge amount main cast members for their autograph sets, which is a coup for the show's fans. 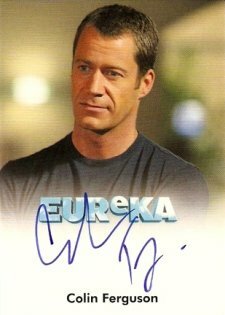 Card collectors looking to try something different probably won't be so excited as not many signers have had notable major roles outside the show. There are a couple of exceptions, but the crossover appeal isn't as deep as a lot of other sets. Twenty-five cards covering the first two seasons is too small. Granted, that's a card per show, but even with the lengthy card-back descriptions, it doesn't do the show enough justice. Again, this comes down to whether you're a fan of the show. Those who are will find tremendous value, pulling autographs and relics of their favorite characters. For less than $50, there's two autographs, a relic, a numbered insert and two limited base cards. For those who don't know the show, they're likely going to head over to the Internet Movie Database to look for connections to other shows and movies they starred in. 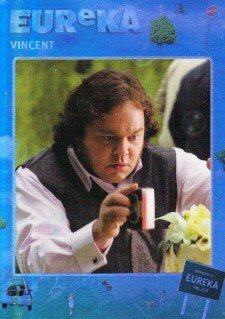 Eureka: Seasons 1 and 2 is a great little set--for people who watch the show. It's got a lot of what they could want in a modern set: great autographs, attractive designs and a limited print run. However, the reach outside the fan base is limited. Being a premium pack product, the bust is over quickly and there's simply not enough for those who don't watch Eureka to get super excited about. Based on the cult hit, Rittenhouse Archives' Eureka Seasons 1 & 2 set is a premium release that offers two autographs and a numbered Artifact costume in every pack. All base cards (two per pack) are numbered to 250. Casting Call inserts are limited to 350 numbered copies. Eureka is about a strange Oregon town filled with geniuses and odd phenomena. 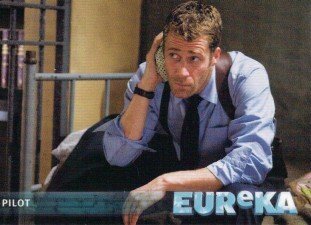 The show is framed around Sheriff Jack Carter, a Eureka outsider as he solves various scientific mysteries. 25-card base set centers on recapping the first two seasons' episodes. Each card is numbered to 250. Autographs (14 cards) inserted two per pack. Artifacts Costume Cards (9 cards, /350) inserted one per pack. Casting Call (11 cards, /350) highlight the show's main cast. Inserted one per pack.